Looking for the Best Facial Plastic Surgeon in Houston? Your face is precious, and when you’re considering facial plastic surgery, such as eyelid surgery, facelift, rhinoplasty, otoplasty, chin implants, or facial fat transfer, it's important to use a highly qualified and experienced plastic surgeon who is board certified. Even when you’re considering less invasive cosmetic procedures, such as dermal fillers or Botox, using a board-certified doctor ensures you are getting the highest quality care with long-lasting, natural-looking, youthful results. 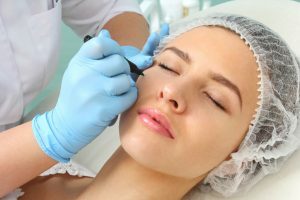 If you live in or around Houston or are willing to travel to the area to have your facial plastic procedure done by one of the top surgeons in the USA, Dr. Cecil Yeung is the best facial plastic surgeon choice for several reasons. Cecil Yeung, MD, FACS, is a top facial plastic surgeon with more than 20 years experience in the art and science of aesthetic facial plastic surgery with a special focus in facelift, rhinoplasty, and facial fat transfer, as well as other surgical and non-invasive cosmetic procedures. Dr. Yeung is double board-certified in facial plastic surgery as well as otolaryngology, otherwise known as the ear, nose, and throat (ENT) specialty. His many years of experience and cutting-edge surgical approaches have led him to develop techniques that achieve natural looking, radiant results for his patients while keeping recovery times to a minimum. Dr. Yeung was the first surgeon in the Houston area to introduce and perform the innovative endoscopic facelift. This method not only reduces scars and post-operative downtime but also delivers the most long-lasting facial rejuvenation available. His long list of satisfied patients makes him the best facial plastic surgeon in Houston. Dr. Yeung performs mostly all of his procedures at the Yeung Institute for Facial Plastic and Sinus Surgery in Houston, but he also maintains numerous hospital affiliations in the Houston area. The Yeung Institute is a beautifully appointed, fully modernized, luxurious facility where patients experience the utmost in comfort and safety. The state-of-the-art Surgery Center provides patients with access to top anesthesiologists and nurses, all without the inconvenience of a hospital. If you are interested in achieving long-lasting and natural-looking facial rejuvenation or require facial reconstructive surgery, we invite you to visit the Yeung Institute to see first-hand the ultramodern, up-to-date Surgery Center. Private parking makes your visit easy and convenient. Or contact our office today by sending us a message to learn more about facial plastic surgery procedures that are best for the results you’re looking to achieve. You can also get started with the best facial plastic surgeon in Houston by filling out the appointment request form right on this page.